And honestly I do not blame you. Nintendo's presentation at E3 this year was terrible at explaining it, with their focus placed squarely on a handful of gaming experiences, and virtually no valuable exposition regarding the machine itself. I've run in to a lot of people—many that are gamers that heard about the system second-hand—who think the controller is the entire thing. So here, let me briefly address some common misconceptions so we can all be disappointed for the right reasons. If you paid reeeally close attention to the E3 presentation, you might have noticed that there was a little white box sitting beneath the TV. That is not a Wii. That is a brand new home console, a full generational leap beyond the Nintendo's current machine, just like the GameCube, Nintendo 64, and Super Nintendo Entertainment System before it. THAT is the Wii U. This is a bit redundant, but it bears repeating considering the physical similarities. 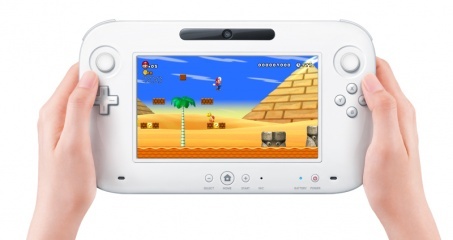 Yes, the Wii U is a thin white box with a slot for a disc and a little door for an SD card. But you'll have to trust me here: it is not a Wii. It's a bit longer, it's got rounded edges, and it's more powerful than a Playstation 3. That final bit is the real kicker here. While you might be confused if all you've seen are screenshots of New Super Mario Bros. Mii, that new white box indeed packs enough power to run every single game you've seen on the PS3 and Xbox 360, and then some. Now there's debate regarding how much that "some" equates to, but a current guess places it 50% beyond the PS360 average. The point is, the Wii U is not two Wiis duct-taped together—it's Nintendo's first full generational leap in console hardware since 2001. What it's not is a full generational leap beyond the PS3 and 360. It's more powerful than them, absolutely, but we'll have to see where Sony and Microsoft's new boxes go whenever they come out. This upcoming generation may be quite different from what we're used to in terms of both timing and relative system strength. Nintendo has been very non-committal about whether you'll be able to use two Wii U controllers on a single system. At the very least they won't be packing more than one in the box, and you won't be able to buy new ones separately. The Wii U's controller is meant to function as an ancillary screen for the machine itself, not for every player in a multiplayer environment. That said, the Wii U supports all of the Wii's controllers. That includes Remotes, Nunchucks, Classic Controllers, MotionPlusses, and even the balance board. 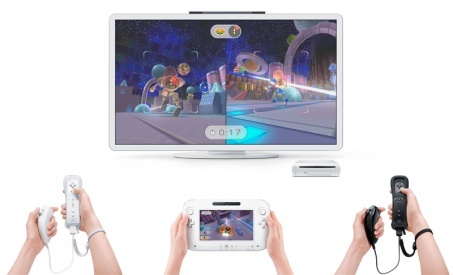 If you're playing local multiplayer on the Wii U, you'll be using something from this list. Many of the demos at E3 featured one player holding the Wii U controller, and up to four others playing along with Wii Remotes. This is a new concept in a home console, which might be why it's so confusing. Perhaps evidenced by the system name itself, the Wii U is building heavily on the groundwork laid by the Wii. Rather than replacing your existing system entirely, consider the Wii U more of an inline upgrade. Swap the boxes out but keep all of your controllers around, because you'll still be using them. Many people speculated about this prior to the Wii U's official reveal, when the myriad rumors indicated wireless streaming of video to the controller's screen. While we have confirmation that the Wii U's controller can indeed receive full game video on the screen and be used without even turning on your TV, this is not a hard and fast rule. It's a bit of an odd situation really, as a developer will have to decide between making a game that really utilizes the Wii U's controller screen in a unique and dependent way, and a game that uses it only superficially so the game doesn't break fundamentally when you're using that screen exclusively. I'm sure many developers will opt for the former option, which means only-controller play simply won't be an option for whatever they produce. So don't go expecting it for everything. Nintendo's spokespeople are saying very confusing things about the system's online capabilities, and the Internet isn't taking it very well. For every quote from Nintendo that seems to spell disaster, a more reasoned interpretation basically negates the whole thing, and we're left with nothing. So here's what's actually being said: Nintendo hasn't nailed down anything yet. They don't want to make a hard-set system where developers have to conform to what it demands. They are asking developers what they'd like to do. What we don't know is the next step, and that's what could make things very good or very bad. If the next step is taking developer opinions and building a perfect system around them, then hey that'd be great. If the next step is "nothing" though, and "we don't want to lock down developers into one system" means there won't BE a system, then nobody is going to be very happy. I'd love to be able to say it's a ridiculous notion, but this is Nintendo we're talking about, and it's foolhardy to give them the benefit of the doubt when it comes to online infrastructure. Next steps are the name of the game overall here. Will Nintendo have another event soon to clear up some of this confusion? Do they even know the answer to some of these questions? It's probably best as fans to just.. not think too hard about it right now. There's not enough information out there to make any accurate predictions. Hopefully we're all on the same page now though, and can have a dialog based in reality.